1. 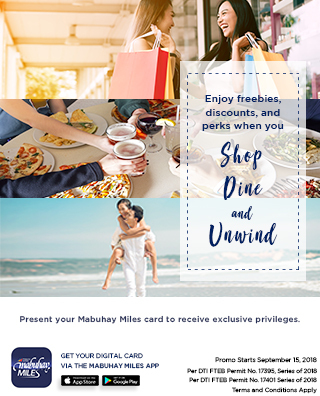 Customers must present their Mabuhay Miles membership card (Physical or Digital Version, Mabuhay Miles Travel Card, PNB Mabuhay Miles Credit Card), together with a valid ID to avail of the Buy 2 Adult Tickets, Get 1 Free Adult Ticket offer at ACE Water Spa branches. 2. Offer is valid daily except during holidays. 3. Offer can be availed without prior reservations. 4. Offer can be availed from April 1 to October 30, 2019 only, subject to block-out dates. Per DTI-FTEB Permit Number 5592, Series of 2019.